He’s quite remarkable, for a 17-year-old. 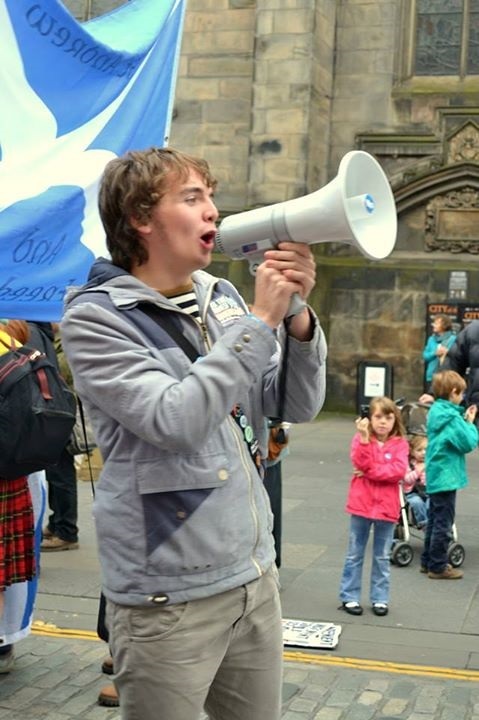 As well as a Yes Scotland campaigner, he’s an MSYP, the co-ordinator of the Inverclyde Radical Independence Campaign, a member of the International Socialist Group, an outspoken Agnostic who attended a Catholic school, and a Rangers fan. Sitting across from me, dressed casually in jeans and a t-shirt, while keeping to the recent trend of wearing multiple wristbands at the same time, Sean Paul O’Connor is part of the so-called ‘disengaged generation’ – teenagers who would, allegedly, sooner sit around watching Big Brother or X Factor than participate politically during this pivotal and exciting time in Scotland. Well, if that is the rule, then he is an exception. It is rare to find someone so obviously impassioned by the thought of political debate in a society so contradictory when it comes to youth involvement. When the platforms are dominated by those who seem to encourage young people with one hand, only to muffle their voices with the other when their opinions are not in tune with the mainstream, it is refreshing to hear a teenager speak so freely. Far from the Big Brother/X Factor stereotype, Sean’s formative years were shaped by attending protests with his mum, Trisha – a process of politicisation that leaves him in no doubt about his radical beliefs. I point out that he’s only 17: how does he know radical independence is the right kind of change? “Things like scrapping Trident and using the money on people is what I mean, and I think that will only happen with independence,” he says. “Voting Yes is just part of the journey – long after that we’ll still be fighting for more change. He talks animatedly about the Radical Independence Campaign – a group that’s been gaining more national attention in recent months for their grassroots campaigning and relentlessly positive approach. He does, however, make a point of reiterating the fundamental difference between the RIC and Yes Scotland. “First of all,” he says, lifting his right index finger and catching it with his left hand. “Radical Indy isn’t about fancy suits or politicians – it’s a grassroots campaign. “With Yes Scotland, we host stalls and give out leaflets. With Radical Indy you’ll see us at protests about social injustices like the bedroom tax. By his own admission, the RIC has done a lot to unite the political left-wing in Scotland. When I put it to him that kind of cooperative effort may not be sustainable after a Yes vote he responds, if possible, even more passionately. “I think it will stay together,” he says. “As long as Radical Indy keeps progressing and giving ordinary people and lesser-known politicians a platform, I don’t see why anyone would want to leave just because we get independence. He does, however, have the political nous to acknowledge there is a point the campaign could reach where separation became acceptable – but only after certain fundamental needs were met. “I could see splintering if and when we got the basics – our own currency, the abolishing of the monarchy and an end to Trident, for instance. At this stage I realise just how long we’ve been talking – around 45 minutes – without one mention of that notorious independence debate buzzword: oil. Various other subjects are discussed, all of which he debates with equal gusto. There is no real basis for comparisons with Ireland, he insists, as our tidal and wind energy, not to mention our oil, provides us with resources the Irish don’t have. He also maintains the lowering of the voting age seemed natural – as an MSYP he was part of research into the practicalities of allowing 16-year-olds to vote before it was introduced. His only criticism of the situation is aimed at schools, which he insists should be including more classes on preparing young people to vote, how to handle money and adult life. The problem of a gender imbalance in politics is something even career politicians still refuse to recognise properly – but here sits a 17-year-old openly proclaiming it a problem. “While on the Yes side we have strong female characters like Nicola Sturgeon and Shona McAlpine, just a look at the TV debates tells a massive story: Sturgeon against three guys, two of which were middle-aged and white. “In saying that – with Holyrood we do see a difference to Westminster. We have a female presiding officer and three of the major party leaders are female. Our time is already well over what we arranged, so to conclude I ask him one simple, yet extremely difficult, question: what if Scotland votes No? “Then I take a big breath, lock myself in my room for a week and have a wee cry,” he says, laughing. “Independence may be my biggest fight right now, but my biggest belief is social justice – that’s what I’d spend my time on. With remarkable young characters like Sean taking active roles in the campaign – you’re inclined to believe that. Inspiring stuff from this young man, I hope those of his age realise what an opportunity we have in September and don’t let it go to waste. They may be much older if they ever have an opportunity again. interesting guy, he’d make a good member of Scottish parliament , I see our country dividing into a many more political parties after Indy, might be a good thing to see……………. Sean Martin’s done a great job. And I’m not the only young person doing these sort of things, just happen to do a lot of them haha. In a similar vein in the YesAlba entry into FilmG’s competition. It’s all in Scottish, but you’ll get the jist. Vote for it! Very encouraging to hear about Sean, what a contrast with the young carrerists in Scottish Labour.